Salmon have the reputation of being very determined fish as they usually swim upstream to spawn, an effort that usually results in them dying after building their nests. However, they face an even more daunting upstream battle against the bleak prospects of extinction. In this article, we will learn some basic facts about salmon fishing, and look at the evolution and future of the industry. There are two main species of salmon; the Atlantic salmon commonly found in the north Atlantic, and the Pacific salmon of which can be found in the wild in the North Pacific. Read more about the types of salmon and general facts here. There are several factors contributing to the decline in salmon population, which include overfishing, hydroelectric dams, pollution and biological hazards. Fishermen are harvesting wild salmon too intensively, causing salmon numbers to drop to a dangerous level. As a result, numerous initiatives for salmon conservation and management have been formed especially in salmon-producing regions. Hydroelectric dams cause a problem to salmon breeding activities as they hinder the fish from swimming upstream, making reproduction nearly impossible. Pollution can come from various sources including factories, housing areas and agriculture. Salmon also face the threat of sea lice, which are predominantly a problem in salmon farms and will be covered later. Those familiar with the economics concept ‘Tragedy of the Commons’ may well know that excessive fishing of wild salmon will lead to eventual run-down of resources for all. In response, salmon producers have turned to salmon farming or ‘aquaculture’. 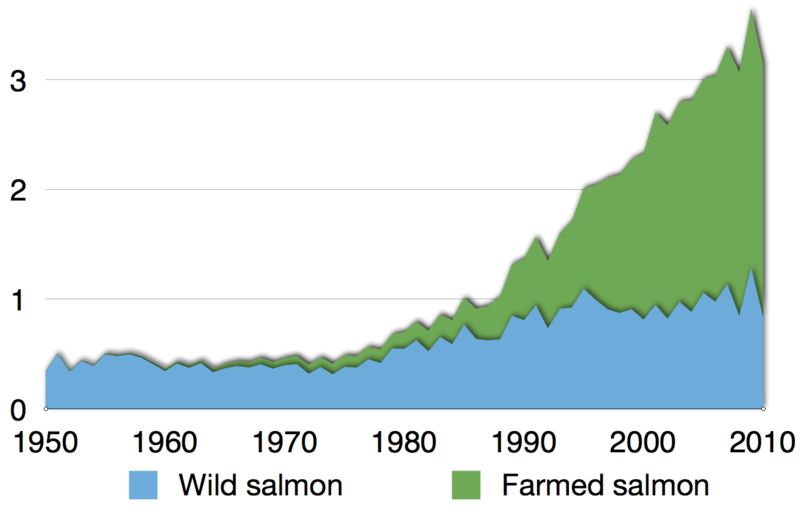 Since the 1990s, commercial production of farmed salmon increased drastically as shown in the chart below. There are various methods of salmon farming, but they usually involve the use of hatcheries (where young salmon are spawned from eggs and bred to maturity in fresh water) and sea cages (where mature salmon are kept in saltwater to grow further before harvesting). More information about the salmon farming process can be found here. 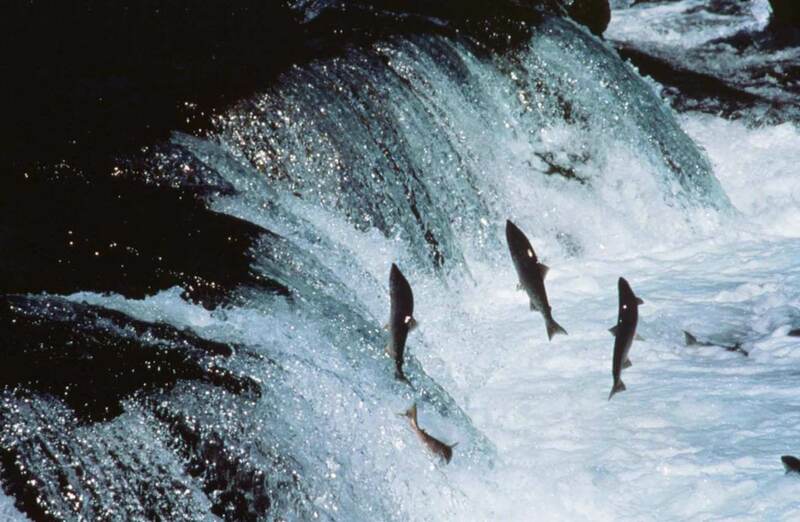 Worldwide production of salmon surpassed one million tonnes, much of which involves Atlantic salmon (more than 90% of farmed salmon and above 50% of global aggregate). Today, Norway is the world’s leading exporter of salmon, followed by Chile and Scotland. Parts of Europe, Canada and Faroe Islands are also major producers of a smaller scale as shown below. Source: Asche, Roll, Sandvold, Sorvig, Zhang. Given the hype about Japanese sushi and sashimi, one may expect Japan to be a major exporter of the fish, but surprisingly the opposite is true today. 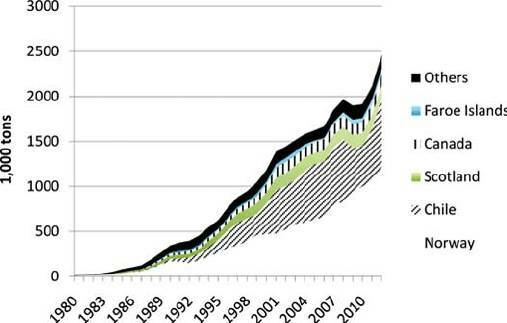 40 years back, Japan was still a net exporter of salmon despite their above average consumption of the fish. By the 1990s, Japan turned into a huge importer of the fish due to a combination of overfishing (depleting their fish supply), exclusion from fishing zones of other countries, and their massive glut for raw salmon. Find out more about the Japanese salmon market here. Looking at the corporate side, Marine Harvest, a Norwegian fish farming firm is the industry leader with 420,000 metric tonnes of total salmon production in 2015. Mitsubishi Corporation, the same corporation that makes cars and machines, comes in at second place to dominate the industry as well. While fish do not have hair or fur, sea lice still managed to find a way to give salmon a sore patch. They are small (less than 1.5cm long) marine parasites that occur naturally in the ecosystem; adult fish can live with them. They mostly pose a problem in fish farms due to the chemical conditions that all them to thrive and kill off the salmon population. Sea lice are killed off during the spawning process when salmon swim upstream. Sea lice cannot tolerate freshwater and will die off, leaving the path for the salmon offspring purged of these parasites. In fish farms, breeding grounds are created, enabling them to dominate and threaten the fish. Worse, fish farms are usually situated near spawning sites of salmon, so the passing of the newly spawned young salmon will facilitate the spread of sea lice, killing the young salmon before they can reach full maturity. Read more about these pesky creatures here. For the fish farmers, these pesky creatures cost an estimated $550 million in lost output annually and various methods have been employed to tackle the problem. 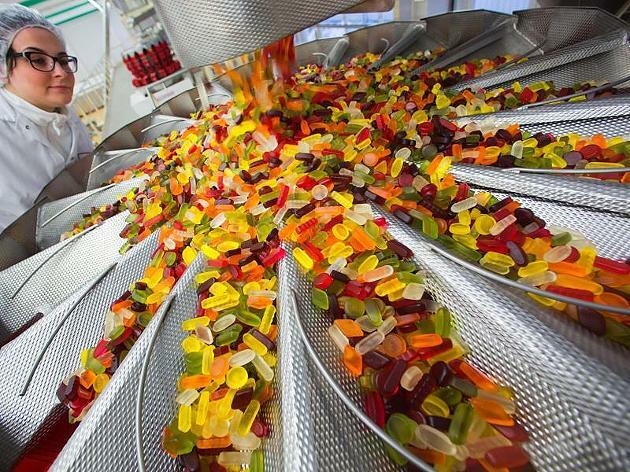 A specific chemical, known in industry jargon as ‘Slice’, has been used for decades. However, sea lice have been developing resistance to the drug, prompting farmers to use ever-increasing amounts of the compound. Another method to get rid of these lice is a thermolicer, which is really just a hot-water bath in concept. The idea is to plunge the fish into scalding water, which kills the sea lice, but also sometimes the salmon too. One particularly unfortunate incident that Marine Harvest experienced was the accidental killing of 175,000 fish while using the thermolicer. One negative externality from this is that sea lice do not just remain in the fish farms, they find a way out into the sea and plague the wild salmon in the open waters too. Salmon, just like any other commodity, is subject to supply and demand pressures. Sea lice incidents earlier this year in Norway and Scotland were the main drivers behind the 50% wholesale price hike, further compounding Chile’s lower production from a deadly algae bloom. Note the sharp spike at the beginning of the year in the graph below. It’s not easy to find a representative market price for salmon, as the price of salmon varies greatly by quality, location, size and origin. In other words, it is not homogenous enough to be lumped together and traded as a single, international good like gold, silver or crude oil. However, some price indices (such as the one above) can give a good overall idea of the market price movement in general as prices of different types of salmon tend to move together. 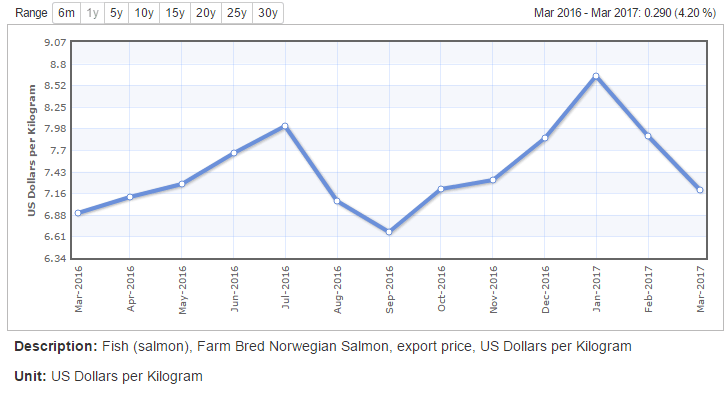 Another good index is the NASDAQ Salmon Index, which captures a weighted average of export prices of Atlantic salmon from Norway. It should be noted in that the index divides salmon according to their weight classes, and 80% of the fish pool weigh between 3-6kg. Generally, salmon price is mostly affected by supply side factors, which fluctuate a lot. An adverse supply shock that wipes out salmon supply in a producing country can lead to sharp spikes in price as talked about above. Thus, investors should keep a look-out for news of biological factor changes in major producing countries (temperature rises, sea lice, algal bloom). As a general statement, demand for salmon has been steadily rising over the years; there will not be much fluctuation to the trend except for health scare occurrences. Finally, exchange rates play a huge role in salmon prices. Due to the oligopolistic structure of exporting countries, these select few countries carry great weight in the export market. Any change in exchange rate will mean changes to the price of salmon in terms of the currency of the importing country (and changes to the profits of the exporting country in terms of their currency). For instance, an appreciation of the Norwegian krone will lead to a rise in salmon prices in terms of US dollars. Salmon falls under the category of perishable commodities; fish can only be kept so long before it starts to lose its freshness and quality. When dealing with perishable goods, temperature conditions are of utmost importance and must be kept consistence at the right level. As such, most spoilage occurs during the transportation phase, where maintaining the optimum temperature is not easy. Typically, farmed salmon is transported via ocean, but sometimes other perishable commodities can be delivered via land (trains, trucks) or air. Each of these vessels have cooling systems; however, land transports tend to have inferior temperature control. Food loss (or food shrinkage) may cost businesses large losses. Statistics show shrink rates can range between 2.2% to a staggering 62.9% between agricultural produce. An estimated 5.9 billion pounds of fruit and 6.1 billion pounds of vegetables went to waste in 2011-2012. For small businesses, such losses may make financing unsustainable due to insufficiently high profit margins. Scale is crucial for businesses to surpass the break-even point, and as such, it is rare for small-scale businesses to export to other countries; they are limited to domestic markets. Being an agricultural commodity, salmon is subject to unpredictable weather patterns. In particular, droughts affect wild salmon while floods may adversely impact salmon farms and wild salmon alike (though this effect is complicated). Barring unpredictable factors of nature and climate, two other major factors affect the outlook of the salmon industry and its price movement. Demand will be an important component affecting the salmon market; if more people start to eat fish, the industry will thrive. 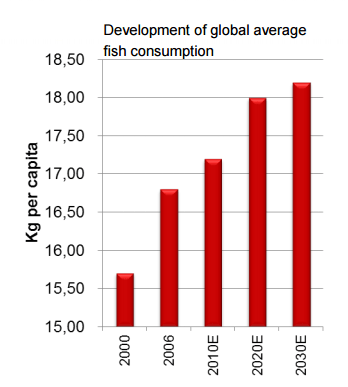 According to a report by Marine Harvest, global average fish consumption is projected to increase over the next few years as shown below. Demand will also be affected by how people perceive farmed salmon over wild salmon; there have been health concerns over the type of feed used and the colouring of farmed salmon flesh to make the meat more appealing. The next factor will be industry innovation and regulation. A law on sustainable farming would help limit salmon supply, bring the price up and at the same time allowing wild salmon populations to recover. Industry technology for better ways of farming, de-licing and feeding will certainly lower costs and increase supply of salmon. Industry players are looking into new methods of killing sea lice and saving costs. Global supply of salmon is on an increasing trend and can be expected to remain so. 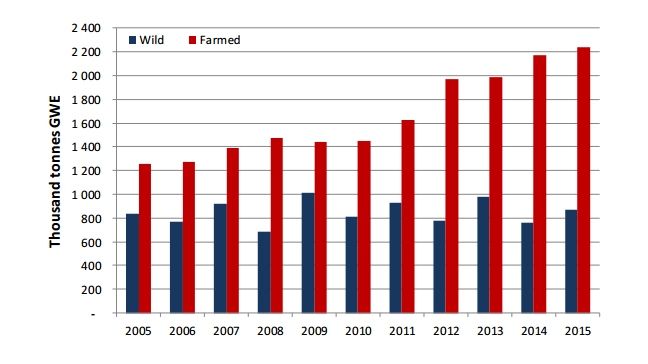 It should be noted that salmon supply growth is mainly driven by farmed salmon supply; wild salmon supply has been stagnating for the past decade as shown below. Global forecasts for farmed Atlantic salmon is projected to remain high for this half of the year, even if further algal blooms do not break out. Investors should look towards the second half of the year with anticipation of a price fall due to the late summer harvest. Demand growth is expected to outstrip supply growth, at least in the short-to-medium term. Give a man fish, and he will eat for a day. Teach a man to fish, and he will start a salmon farm as it is lucrative business. 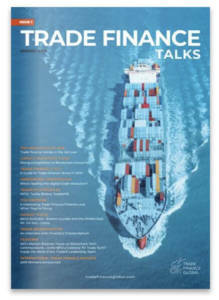 Financing is thus of utmost importance, which may be facilitated using trade finance.